Potential residents looking into real estate in Midtown are drawn to the area’s vibrant art scene and numerous theaters. The area of Midtown starts about one mile north of Centennial Olympic Park in downtown Atlanta and includes many restaurants, night clubs, playhouses, museums and shops. Those looking to stay away from the suburbs and experience downtown living filled with art and culture are impressed by the inviting and exciting area. Craftsman homes on tree-lined streets are located just outside the bustle of the city, near Piedmont Park. 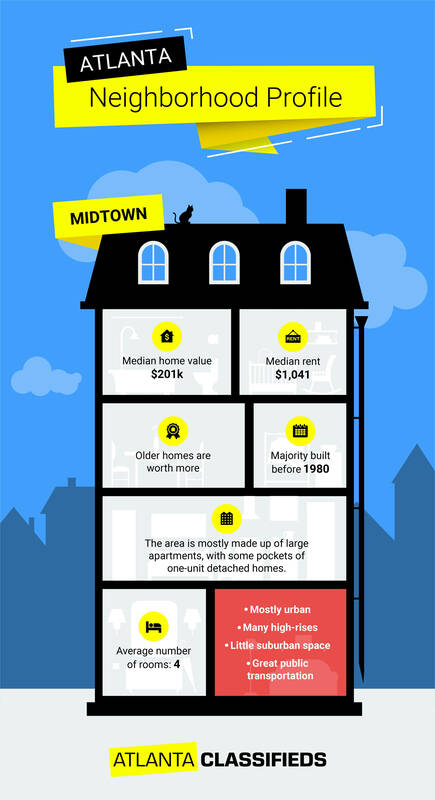 The median homes sales price in Midtown is $292,900. This average price may also include condos and townhomes scattered throughout the Art District and West Midtown. Most single family homes can be found for over 900k, especially if they are located on Piedmont Avenue or Myrtle Street. The median sales price for houses in the area is gradually increasing. Tips for renting an apartment or buying a home in Midtown Atlanta, GA.
Apartments are common in Midtown and are available for rent in both high-rise buildings downtown and smaller complexes in suburban areas. The average monthly rental price for apartments in Midtown is $1,897. New construction complexes can be found near Atlantic Station, while older apartment buildings are scattered around Midtown and usually offer posh updated interiors. Loft apartments with industrial and creative styles are available in West Midtown. There are 40,909 residents who live throughout the area of Midtown and the majority are full-time business professionals. The median resident age is 32 and only 2,018 households have children. Most residents hold bachelor’s or graduate degrees and the median household income is $59,120 annually. Fox Theater: Live music venue that hosts Broadway shows and world-famous musical acts. High Museum of Art: A division of the Woodruff Arts Center with rotating exhibits, including Outliers and American Vanguard Art. Alliance Theater: Performance theater with several galleries and stages that draws local and national acts. Atlanta Botanical Garden: Large garden with meandering paths, usually complemented by rotating art installations, symphony performances or live theater events. Close to Atlantic Botanical Garden is Piedmont Park. The park is a large greenspace for residents to enjoy and often offers free outdoor concerts, events or movies. Residents living in properties in other areas can easily travel to the Arts District and all of Midtown using the train or bus line. The Metropolitan Atlanta Rapid Transit Authority (MARTA) is the bus and train line available throughout Atlanta. Both the red and gold train lines can be picked up at the Midtown Transit Station on 10th Street near Peachtree Street. The Arts Center transit station is also available near the High Museum. There are connecting MARTA bus routes at five different locations throughout Midtown. Taxi cabs and ride-sharing programs are also available in the area. Atlanta’s famous Beltline, a walking or biking trail, runs through parts of Midtown and follows a similar route as the MARTA train lines. Residents who live near their destinations can easily walk or bike to several local attractions and the area is considered easily walkable. Although Midtown is focused on art and culture, there is no shortage of spectacular restaurant options in all neighborhoods. Bartaco is located in West Midtown and offers both classic and unique tacos in a stylish décor. Within the perimeter of Piedmont Park is Campagnolo Restaurant + Bar, a rustic Italian restaurant with a large patio. The Art District includes Twelve Eighty, a fun lounge and café with light bites and coffee. The area is also home to countless restaurants, including the Atlantic Grill and Yard House. Several apartments are available for rent within walking distance to shops, including complexes like The Exchange and The Atlantic. Unlike the suburbs, West Midtown is an area with expansive nightlife. In addition to night-time events, such as the Art Walk, the area includes nightclubs and art-inspired bars, such as the Establishment, a rustic-chic bar with small plates and creative cocktails. Bar Margot is also located in West Midtown near the Four Seasons Hotel and serves signature cocktails late-night. Homes in Midtown are desirable to young residents and families alike due to the area’s low crime rates. Midtown’s overall crime rate is 11 percent lower than the national average. Most crimes committed in the area were property crimes and not violent crimes. Since most properties and businesses in Midtown emphasize art, it is no surprise that the Art District is home to one of the many Savannah College of Art and Design campuses. Midtown also houses the Atlanta College of Art and the Scheller School of Business.